The lifting of penal laws against Catholics took place over a number of years, beginning in 1778 and culminated in the repeal of the Test and Corporation Acts in 1828 and the granting of Emancipation in 1829. The re-establishment of an Episcopal hierarchy in 1850 signalled the Second Spring of the Catholic Church in England, preached by Cardinal Newman. The duty of the recently appointed Bishops was to safeguard the faith of their flocks by providing churches for worship. In many areas of England, including West Yorkshire, the growth of the Catholic church was increased by the influx of Irish immigrants fleeing from poverty and political unrest, attracted by the buoyant employment prospects offered in the area at that time. In 1841 Bishop Briggs sent Father O'Leary to Dewsbury, where in a rented room he said the first Mass for some 300 Catholics. St Patrick's was the 4th parish established in the local area. It was preceded by Batley St. Mary's, 1853 and Batley Carr St Joseph's, 1881; themselves deriving from Dewsbury St. Paulinus, which was founded in 1841. In the Bishop's visitation to Batley of 1870 the records state the the Church also owned land at Birstall on which there is a shop and house and four cottages. Documents held at the diocesan Archive, dated 7th December 1870, describe the land as "all that messuage or dwelling house and shop site at Low Lane End in Birstall with garden, yard and land.... and also 4 cottages or dwelling houses situated in Birstall." It further stated "that this land was to be held in trust for the premises built there to be used as the site of the Church, Chapel or place of religious worship, a site for a school and dwelling house and for any other purpose which the Trustees might think fit for the benfit of the RC congregation." The bulk of the flock resided in Batley and Birstall, although the Parish covered Batley, Birstall, West Ardsley, Morley, Gildersome, Gomersal and White Lee, the greatest distance to the church being four miles. It was stated that those who lived the greatest distance away were generally the best attendees at Mass. It was also stated in the Visitation papers of 1870 that there was sufficient school provision for the children of Batley but not for the children of Birstall. A priority of the church at that time was to provide Catholic schools as voluntary schools received little government help and the expenses of these schools had to be met by parish collections. It is known that by the mide 1870's a day school existed, house in premises somewhere in the Brownhill/ Brookroyd area. However a permanent school (now demolished) was erected in Birstall by the parish priest of Batley, Father Gordon, in 1876. A History of Birstall records that on Whit Tuesday 1876 two brass bands and over 1000 adults and children processed along Low Lane for the laying of the school's foundation stone. Before the Church was built, Mass was celebrated in this school using a cupboard used as an altar, prepared each Sunday by Mother Mary and Sister Gertrude. In 1881, Father Lea, the parish priest of Batley introduced to Birstall the Sisters of Charity of St. Paul, whose head house is now in Birmingham. The pioneer Sisters were Sister Barbara and Sister Joseph and till 1894 they had charge of St. Patrick's School, and by devoted service helped to lay the foundations of a truly Catholic life, thereby winning the affection of their pupils and the respect of all sections of the community. Nuns from this order are still a part of St Patrick's parish community. St Patrick's school is now at a new site in Nova Lane. The existing school building was built in 1965 and has been extended three times. To find out more about St Patrick's school click here. In 1905, with numbers increasing, St Patrick's was established as a separate parish. Father Russell, relying on the support of a growing parish, erected the church, designed by Mr. Simpson, of Bradford. The foundation stone was laid by the Bishop of Olanus, Bishop Cowgill (co-adjutor to the Bishop of Leeds, Bishop Gordon) on Saturday 2nd May 1908. Various families donated the interior furnishings of the church - perhaps the greatest benefactress was Miss M. A. Mortimer. Father Russell was the first Parish Priest of St. Patrick's (1905 until 1931). He died in 1945. 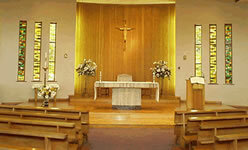 He celebrated his Silver Jubilee as a priest on 26th June 1926. We understand that the parishioners bought him a car to mark the occasion! Mother Mary, who taught in the old St. Patrick's School. She is buried in St. Peter's Cemetery, in a plot apparently given to her by the then vicar of St. Peter's. 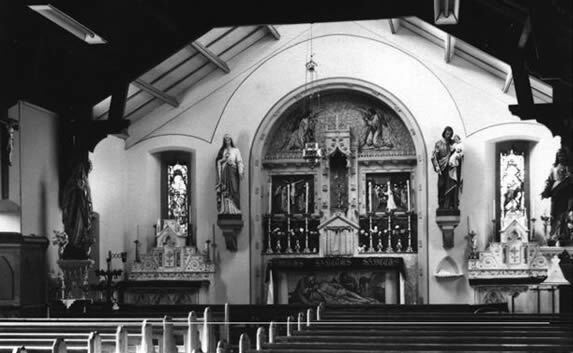 The photograph to the right shows the interior of the old church. The stained glass windows, at either side of the altar, are now in the Blessed Sacrament chapel of the present church, along with the frontispiece of the altar (pictured below). Statue of Our Lady at the entrance to the old church, now the Social Club entrance. Stained glass window showing our patron saint St Patrick. 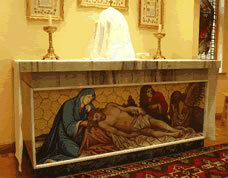 This was in the old church and can now be seen in the Blessed Sacrament Chapel. The new building provided additional space for the school in the lower storey and the new church above. The building has been adapted and is now used as the parish social club. This happened after the present church was built in 1970, during Father O'Reilly's time at St Patrick's. A chapel of ease was established in Birkenshaw in 1946. This new Mass centre demanded the services of a second priest in Birstall. Bishop Poskett sent Father O'Reilly as assistant priest, 1945-52, and on his retirement to Huddersfield Father P. J. Creed took his place, 1952-53. Bishop Heenan appointed Father P. J. Kelly (1953), who came from St. Clare's, Bradford. St Patrick's had two priests for several years but falling numbers of priests has meant in recent years, this has not been possible. The chapel at Birkenshaw has now been closed. A sports field was bought in 1950 and this is used for the annual Summer Fayre. The Foundation Stone of the present church was blessed by Bishop Wheeler on 12th, December, 1969. The Church was officially opened by Bishop Moverley on 25th, September, 1970 in the presence of Bishop Wheeler. The preacher was Bishop O'Herlihy of Ferns, Co Wexford. The Consecration of the Church took place on Monday, 19th, March, 1973 in the presence of Bishops Wheeler & Moverley. The preacher was the Rev. James O'Higgins SJ. Views of the present church, built in 1970.